FREE for MCD Members. Free with paid admission. 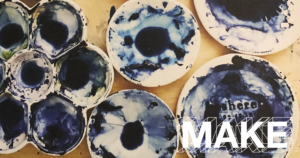 Design your night at MAKE! 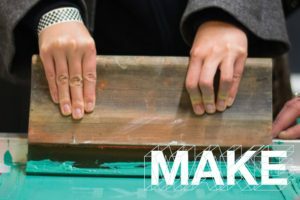 On the third Thursday of each month, collaborate with artists and makers, explore unique themes and rethink materials through creative design projects. Enjoy hands-on art activities and crafts, artist-led happy hours, films, tours, performances and much more. Each month features a different experience and projects. Cash bar for guests over 21 and complimentary drink tickets for MCD members; ID is required. Space and supplies are limited; some events may require a nominal materials fee. There will be no MAKE events in November and December. Join us for our debut event on March 15 celebrating National Craft Month. SF Etsy will be on-hand to help you find the inspiration you are looking for! We have put together an evening you don't want to miss! Come play with adhesive vinyl as found in t.w.five's current exhibition, try your hand at silk screen printing, contribute to an in-gallery crochet bomb, make your own bitters, enjoy some craft beer and capture the night's memories at the photo booth. This April, join us for a complimentary glass of wine during our Artist Happy Hour, featuring the Sonoma Ash Project from 6-7pm. Then, look to the Tom Loeser exhibition for inspiration while exploring creative reuse with local upcycle designer and artist Miles Epstein, take a trip to the SCRAP craft buffet and create Earth Day succulent crowns with Oakland's Mannequin Madness. Design your night at MAKE! On the third Thursday of each month, collaborate with artists and makers, explore unique themes, and re-think materials through creative design projects. We kick off this month's festivities at 6:00 PM with our Artist Happy Hour at and book signing featuring the brand new art book, “Hate is What we Need.” In this clothbound, hardcover volume, acclaimed artist Ward Schumaker transforms the egregious utterances of the 45th president of the United States of America into provocative text-based paintings. 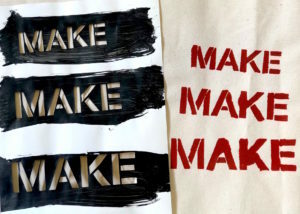 Hear from Ward about the creation of the book and then explore his unique stenciling technique by replicating the process on your own canvas tote. Come early to enjoy a complimentary glass of wine and MAKE hate into love! This month we craft our inspiration from the work found in Raw Design. Join us for a free glass of wine during our 6 PM Artist Happy Hour with ceramicist Ilana Crispi to learn about her Mission Dirt Project-- an excavation of dirt along Valencia Street that culminates in the firing of the physical material in order to examine questions of home, history, geology, and ownership. 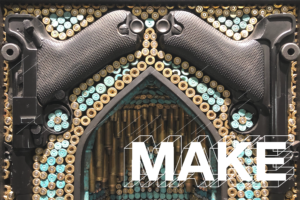 Get prepared for Burning Man at MAKE! Use a technique from the Playa Fairy herself to make jewelry you can gift to all your new friends. Plus, create a fanny pack fit to hold all of your essentials while keeping your hands free for dancing and bike-riding. Don’t forget to craft a found-fabric dust mask and BRC-worthy shades to keep you comfortable in all elements! 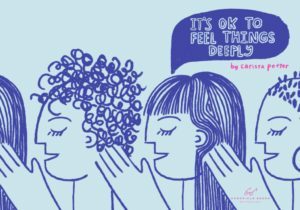 Carissa Potter is our guest artist for September MAKE and the inspiration behind our crafts for the evening, including DIY books, vision zines, and custom illustrated postcards from her book, "It's OK to Feel Things Deeply." 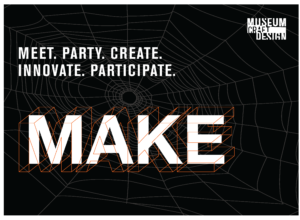 Celebrate the spookier side of Raw Design with an evening creating “In Cold Blood” beeswax candles, wall-mounted mythical creature skulls and never-rot foam pumpkin decor for our third Thursday event, MAKE! 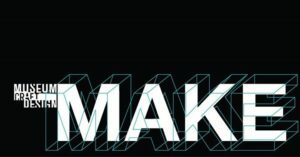 Join MAKE in January for the launch of DESIGN15! It’s a whole year of celebrations in honor of MCD’s 15th anniversary. Enjoy a final look through Divine Ammunition, where you will honor Al Farrow’s complex and intricate work with in-gallery projects and conversations. Celebrate National Craft Month with SF Etsy and welcome MCD’s spring shows with an exploration of Material Domestication and Wanxin Zhang: The Long Journey. MAKE: In Pursuit of Inspiration. April 18, 6:00 PM - 9:30 PM. This month, MCD welcomes beloved Bay Area artist, author and ceramicist Rae Dunn to celebrate the pre-release of her brand new book, In Pursuit of Inspiration.